История: This uniform was introduced during the UN intervention in Somalia in 1993. Расцветка: Three colours: tan background and green and brown spots. 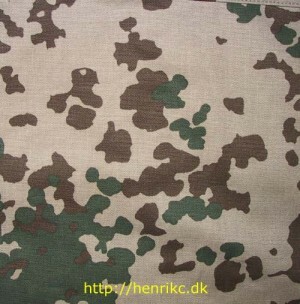 The pattern is based on the standard German 5-colour Flecktarn Camouflage pattern: green (13.3 %) is replacing black, brown is brown (17.5 %) and the dark green, light green and grey green are tan (69.2 %). Дополнительная информация: New items are made in slightly different colour - the Somalia-vintage uniforms are slightly grey in the colour whereas the new items are a bit more reddish. This is one of the old uniforms.